It has been a gorgeous last couple days here and today looks just as good. What a great time to get out with the family and spend some quality outside during National Wildlife Week (March 16-20). The National Wildlife Federation website includes free National Wildlife Week activities for kids and more. Under "Educator Resources," lessons plans featuring engaging, hands-on activities from NWF's award-winning Access Nature curriculum guide are also available for free download, including pdf files for Tree Detectives and Bird Behavior. 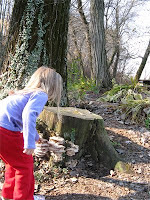 The parent free downloads available include Letterboxing, Nature Rubbings and more. "The current theme is “Be Out There,” in celebration of National Wildlife Week (March 16-20). We're looking for images of people enjoying the great outdoors. If you have photos of wildlife-watchers or folks taking part in other nature activities (gardening, hiking, fishing, camping and so on), upload them now for your chance to win. At the end of April, we will select finalists among these “Be Out There” images and ask group members and others to vote for their favorite. The winner will receive an official NWF wildlife field guide and, if not already a member, a one-year membership to the National Wildlife Federation. This membership includes a free subscription to National Wildlife magazine." Additionally take a look at Greenhour.org. NWF has created GREENHOUR.ORG, a website publication providing parents with the information, tools and inspiration to get their kids outside. All you twitters out there: follow @GreenHour for the latest outdoor activities as they go online on Greenhour.org. Thanks for blogging about this. It is so important to get kids connected with nature and off the couch!